Trade and human rights are among the topics Prime Minister Justin Trudeau intends to raise during a visit to China next month. Trudeau's office finalized details on Sunday of the trip, which will take place between Dec. 3 to Dec. 7. A statement from the Prime Minister's Office says Trudeau will promote a progressive trade agenda and tourism initiatives. The Trudeau government has been wrestling in recent months with whether to launch talks on reaching a free trade agreement with China. Sunday's statement made no mention of free trade and government officials have said no decision has been made on whether to pursue such negotiations. The government recently consulted with businesses, academics and civil society groups and a report of the talks warned that such a deal could kill Canadian jobs and make it difficult to compete with China's lax labour and environmental standards. 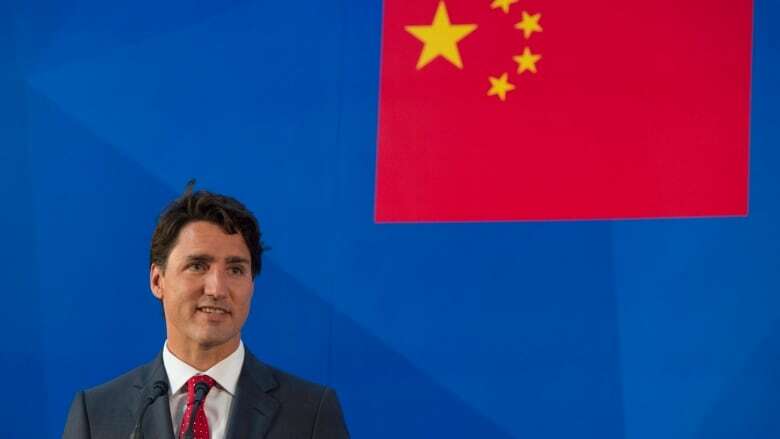 "A strong relationship with China is essential to creating jobs, strengthening the middle class, and growing the Canadian economy," Trudeau said in Sunday's statement. "I look forward to meeting again with China's leaders to strengthen our relationship and set the stage for even greater trade and investment co-operation." The statement also said Canada intends to continue frank dialogue with China on topics like human rights and good governance. Trudeau is to start his visit in Beijing where he is to meet a number of Chinese leaders including President Xi Jinping. He is scheduled to move on to the city of Guangzhou where he'll give the keynote speech at a global business conference and meet with various business leaders about trade and investment. Trudeau made his first official visit to China last year. China is Canada's second biggest trading partner. Canada's exports to China totalled nearly $21 billion in merchandise last year.